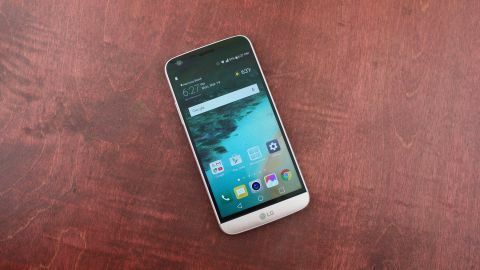 The LG G5 attempted to shake up the smartphone market, and while the phone itself is considered a flop, the direction it tried to push is still noticeable today. Modular capabilities were the big draw for the LG G5, with the promise of additional functionality delivered by add-ons you could buy separately giving you cool extra features. In reality though, the LG G5's modules (or 'Friends' as it like to refer to them) were lackluster, with a camera grip, audio DAC and 360 camera the only options to speak of. The phone itself was still one of the top flagship devices of 2016, and while it's since been superseded by the LG G6 and V30, for those on a budget the G5 provides an interesting alternative to many of the cookie cutter devices on the market. If you're looking for a modular device, Motorola has a line of great Moto Mods which work on a number of phones including the Moto Z2 Force and Z2 Play. LG G5 is a modular smartphone and a massive change of pace for the South Korean firm. It's done away with cheap plastic and confusing leather finishes of the LG G4 in favor of a full metal body, while keeping fan-favorite features like a removable battery and microSD card. That's a big deal, because Samsung disappointed a vocal minority when it ditched its swappable battery and expandable storage hallmarks for the Galaxy S6 and realized the errors of its way as it reinstated microSD support in the Galaxy S7 and Galaxy S7 Edge a year later. The LG G5 may not be as ornate as Samsung's glass-and-metal-fused phone, or Apple's aluminum iPhone 6S, but it's a step in the right direction after the questionably styled G4. Not only does it include perks for power users, LG's changed the way we access the battery with a cartridge-like input so you don't have to remove the back cover. This 'magic slot' is located in the bottom frame of the phone and doubles as an accessory port. Add-ons include a battery grip with physical camera controls and a Hi-Fi audio module. You don't really need either of these accessories to enjoy the camera or audio, though. LG G5 has a dual-camera setup on the back, with one lens that provides extra-wide photos. The front is highlighted by an always-on, 5.3-inch display. It never goes to sleep, with the time, date and notification icons visible when the phone is off. When it comes to price, it launched at around $650 (£500, AU$890) SIM-free for the LG G5, which put it slightly below the Galaxy S7 and iPhone 6S. Thing is, the G5 hasn't flown off the shelves. Almost a year on from launch it's seen its SIM-free price slashed to $442 (£350, around AU$580), and LG has openly admitted it's been disappointment with the G5's "somewhat slow" sales. You also have a big 5.7-inch distraction if you live in the US: the newer LG V20, which comes with a dual-camera system in both the front and the back and runs Android 7 Nougat software out of the box. Some LG G5 phones still run Android Marshmallow. It's far from over for the LG G5 though, and there's still a lot to love about this smart modular phone. The LG G5 looks and feels completely different to the G4, and that's thanks to the all-metal body that rightfully kicks the plastic to the curb. It feels suitably smooth, although the G5 struggles to feel as premium the likes of the iPhone 6S or Samsung Galaxy S7. That's thanks to a relatively thick layer of primer-paint mix which LG has used to the color the G5. Initially I thought the G5 felt more like plastic, and it can be deceiving, but the sturdy aluminum frame becomes more apparent the more you use it. This doesn't mean the G5 feels cheap, far from it in fact, but the finish doesn't sing in your hand. The slender metallic rim which rounds round the edges of the handset on the rear adds an extra layer of class, but it also feels a little sharp. It's not as cutting on my final unit compared to the pre-production model I had, but it's not exactly smooth. Unlike Apple's handset the LG G5 won't be notorious for antenna lines. It doesn't have any of those unsightly bands, instead relying on Micro-Dizing to cover up antenna slits. This allows you to enjoy color of the device, and in the G5's case you get a choice of four: silver, titan (gray), pink and gold. The pre-production handset I used was pink, and the color is rather muted. It's not as dazzling as Apple's rose gold, but at the same time it seems a little apologetic. The hue will likely appeal to some, but for me it doesn't really work. The final review unit I received came sported the silver paint, and it's more agreeable to the eye. Another big difference between the design of the LG G5 and its predecessor is the fact that the curved design has been ditched. Gone is the bananaphone style of the LG G4 and its even curvier cousin, the LG G Flex 2, and it returns to the flat frontage which is the norm in the mobile market. I say flat - it's almost there, but LG couldn't help itself, with the G5's front sloping away from you at the top and bottom. It's a slightly odd finish which offers little in the way of aesthetic grace or practical use. LG's reason for the switch is simple - consumers preferred the flat designs of rival handsets over its own curved offerings. And I'd agree. The LG G5 feels more balanced in the hand and it's easier to slip into a pocket. Downsized from a 5.5-inch screen on the G4 to 5.3 inches and roughly the same amount of bezel, the LG G5 feels light at 159g and easy to hold in one hand measuring 149.4 x 73.9 x 7.7mm. I can reach apps across the entire display without resorting to using two hands, which ties into LG's goal of making the phone all about ease of use and something to recommend to mom and dad. This does, of course, depend on your palm size as those with smaller hands will still find the G5 a bit of a beast. In fact the G5 is almost identical in size to the Samsung Galaxy S7 Edge, which despite having a larger 5.5-inch display has managed to keep excess to a minimum. LG G5's volume rocker has shifted to the left side of the frame, ending the company's opinion-dividing practice of having the buttons flank the power button on back. While I got used to that quirky rear-facing volume keys and clean edges on the G2, G3 and G4, LG's signature feature was a flaw for many. I'm relatively indifferent about the new side volume rocker, however it does make changing volume much easier when it's lying on a desk. Sadly, that same ease of use can't be said for the fingerprint scanner. The still-back-facing power button doubles as a fingerprint sensor on the G5, and while it's better than the questionable experimentation on the LG V10, it's still too small. Like the Google Pixel and Google Pixel XL, it can light up the phone and unlock the screen quickly without you having to press the button. There's no two-step process, as it was on the press-in-and-hold-hold-hold LG V10. The gentle volcanic protrusion it rests on also makes it relatively easy to find, but a slightly larger landing pad would have been nice. The real Achilles heal is realized when you place the G5 on a surface. I tend to have my phone sitting on my desk at work, and if I want to unlock the phone to read a message I'm forced to either tap in my code - ugh, slow - or pick it up and place my finger on the reader. With the Galaxy S7 and iPhone 7, their front mounted finger scanners allow me to unlock far more easily. Even the Sony Xperia Z5's side mounted effort is better in this respect. Sticking with the rear of the G5 and it's the area where most are likely to decide whether they love or hate the look of the phone. The protruding power key sits below a far larger raised area which house the G5's dual camera lenses as well as the LED flash and laser auto focus. It's a sizable presence, and to some it may look like the phone has sprung a couple of nasty growths. On the other hand the protrusions are minimal and if you opt for the darker titan (grey) model they seem less obvious. Something I'm not really a fan of is the headphone jack and speaker placement. Headphones plug into the top, unless you have the 32-bit Hi-Fi DAC module that is, as that adds a second headphone jack to the bottom. Odd. Worse, the speaker is on the bottom. I was really hoping that the LG G5 would upgrade to a pair of front-facing speakers for stereo sound without resorting to headphones. Not this time around.